This week's Sunday Night Suds extends Thanksgiving one more week by reviewing Jack-o Traveler Pumpkin Shandy. The Shandy is the Americanized version of the German Radler which combined lemonade and lager in what can only be termed an unholy alliance. American breweries have taken this combination light years further, including the Traveler line produced by the Boston Beer Company which fuses lemonade, lager and basically anything else they can think of and produces various "Shandy" products. 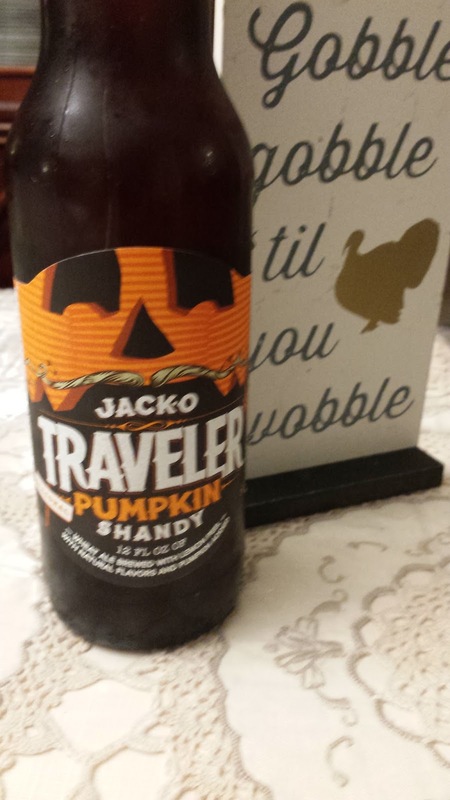 Although its one week post Thanksgiving, I wanted to give this Pumpkin infused Shandy a try. The first sips had some nice pumpkin and cinnamon notes and I thought that I might like this beer. But then the lemonade started to kick in and the syrupy sweet flavor overwhelmed my palate. I could not bring myself to finish the beer in my glass, let alone the bottle and I found myself wondering how I had even considered this to be drinkable.